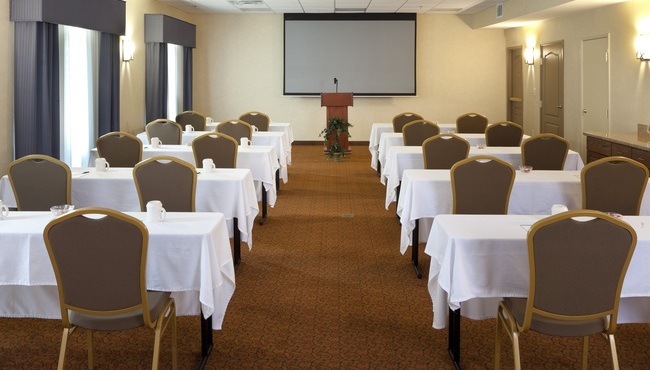 For your next business meeting, banquet or social gathering, reserve the meeting space at the Country Inn & Suites, Rocky Mount, NC, just one mile from I-95. Our facilities include the spacious Stonewall Meeting Room and the smaller boardroom that can accommodate up to 10 people. If you need more space, we also offer breakout rooms and an outdoor area for tent setups. When you reserve a meeting room, you also enjoy access to free Wi-Fi, an LED projector and audiovisual equipment. Traveling with a sports team? Use our space to host a team meeting before heading over to the Rocky Mount Sports Complex. Contact us for information about discounted rates for teams, tours and groups. For additional perks and incentives, we offer these programs: Radisson RewardsTM for Business and our Government Hospitality Program for government employees and contractors. Ideal for an interview or a brainstorming session with colleagues, our boardroom can be outfitted with audiovisual equipment so that you can give a winning presentation. Host a reception or a seminar in the flexible Stonewall Meeting Room, which offers free Wi-Fi, audiovisual equipment and a variety of configurations. Our two conference rooms can accommodate up to 150 when combined, creating the perfect venue for a seminar or family reunion.